With the Ironman 420E elliptical trainer, Keys Fitness has moved things up a level and brought their elliptical machines into a position to really provide a workout that will suit a wide variety of people. Trainers acknowledge that this is where Ironman has realized the importance of stride length to performance. By increasing the elliptical trainer's stride a full two inches over the 250E, the Ironman 420E has a more fluid movement and loses some of the jerkiness that can be a problem for taller users. Many professionals also take note of the programs; while there are only seven pre-set training programs, 3 separate heart rate programs have been added, which they feel are more advantageous for most users. Consumers who have invested in the Ironman 420E elliptical uniformly are pleased with what they get for the price. One user said that he was surprised by the “rock-solid feel” of a machine that he would have paid twice as much for. The increased warranty on the Ironman 420E reflects the company’s confidence in the model. Lifetime coverage on the frame, two years on the parts and a year on labor costs are an extension of what’s offered on some of their lower end elliptical trainers (which didn’t generally need much service anyway). It’s nice to know that when you’re paying a bit more, they’re willing to guarantee a bit more. 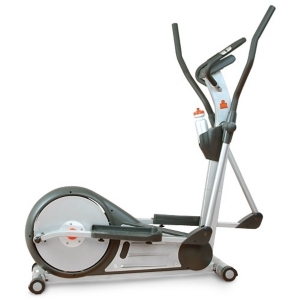 We also like the Ironman 420E elliptical trainer’s increased stride. Let’s face it, stride matters. It would have been great if they could have pushed it to eighteen inches, but sixteen inches is respectable and will work for most users. The three different heart rate programs are distinctive and easy to use, which means you’re practically guaranteed to hit the appropriate target heart rate for an optimal workout.